April showers bring May flowers, but in North Dakota, May often also brings rain. This means a lot of dreary, overcast days. After the long, extended winter months, it can be difficult to endure yet more darkness. Do not fret! There are simple ways, through essential oils, that you can help to boost your moods. If you have ever had the pleasure of encountering an orange, lemon, or lime tree in bloom, you have breathed the sweetest of nature’s fragrances. 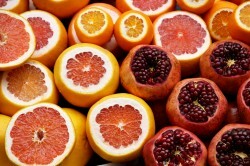 Citrus is intoxicating, happy, uplifting, restorative, and even sensual. Most citrus essential oils can help to bring a smile to the face. These essential oils are rich in compounds called monoterpenes that are known to be stimulating and energizing. They have been shown in studies to uplift individuals from depressive states, also alleviating other conditions such as sleep issues, pain, and malcontent. There are many essential oils that fall into the citrus category, and many of those same citrus are found in your kitchen. Lime, lemon, sweet orange, and grapefruit are familiar; less familiar is the more complex bergamot, the scent in Earl Grey tea. It is interesting to note that citrus has other functions during the colder, darker parts of the year. As a food, citrus provides vitamin C. It is also one of the few fruits in season during the colder months. Many things about aromatherapy follow the natural order, and the use of these essential oils during the darker times of year also has benefit, just like the whole food version. The simplest and safest way to utilize citrus essential oils is in a home diffuser. Any combination of citrus essential oils, up to 10 drops, in your diffuser, can help to clear the air and your mind and strengthen your general constitution. Citrus blends readily with other citrus, so don’t be afraid to play a bit. Bergamot (Citrus bergamia) is one of my favorite citrus essential oils. This tree is a hybrid of orange and lemon. Whereas sweet orange and lemon have so much familiarity that they can seem somewhat unexciting, bergamot shines by comparison. It is bright and uplifting, but also warm and soothing. Bergamot has also been found to be a powerful anti-anxiety substance and is good for those struggling with insomnia. Bergamot has been used in Italian folk medicine as an herb since the early 1700’s as treatment for malaria and worms, but more recently, bergamot has become one of the most frequently-used ingredients in perfumery. Lime (Citrus aurantifolia) is an exciting essential oil. It has zing and zest. This essential oil, like many others, is antiseptic and anti-viral, and has a bright, forward note that will bring one to attention. Mix lime with rosemary in your diffuser to aid in concentration and help with lethargy. Safety considerations are key with all citrus oils as they are all photo-toxic. If you apply citrus oils to your skin and go to the tanning booth or out into the sun, you are at high risk for getting painful burns. Citrus essential oils, with their high monoterpene content, are also the quickest to become rancid. Store them in a cool, dry, dark location.